Wireless Video Surveillance set - CIU Co., Ltd.
IR 2.4GHz Digital Wireless Pan Tilt Zoom Video Surveillance Set with 7" LCD DVR is a indoor use home security camera kit. 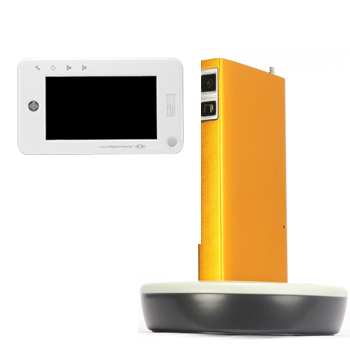 This IR camera with built-in 2.4 GHz digital transmitter which can eliminated the interference problems and transmit the audio/video signal to long distance. The handheld 7" LCD DVR with build-in digital receiver. The wireless digital camera set offers a simple setup procedure, high video quality, long transmission range and full security functions to cover application, home or small office users. It consists of a IR night vision camera with an audio microphone, an integrated digital transmitter and a 4-channel 7” LCD display receiver.